This analysis provides strong evidence that home monitoring of blood pressure is more effective at lowering blood pressure when additional support is provided. This is important because high blood pressure is a risk factor for cardiovascular disease. Evidence from clinical trials has shown that patients with hypertension who self-monitor their blood pressure tend to have lower blood pressure than those patients who don’t. However, the trials that have tested home monitoring show different results ranging from no effect, to a large reduction in blood pressure (9mmHg). We wanted to investigate the differences between the studies in terms of the population involved and the support offered alongside blood pressure monitoring to determine which patient groups would benefit most and how best home monitoring should be supported. We used the patient data from 25 large studies that provided their data (10,487 patients) to analyse the differences between way that home monitoring was delivered and managed, as well as differences between patient groups. 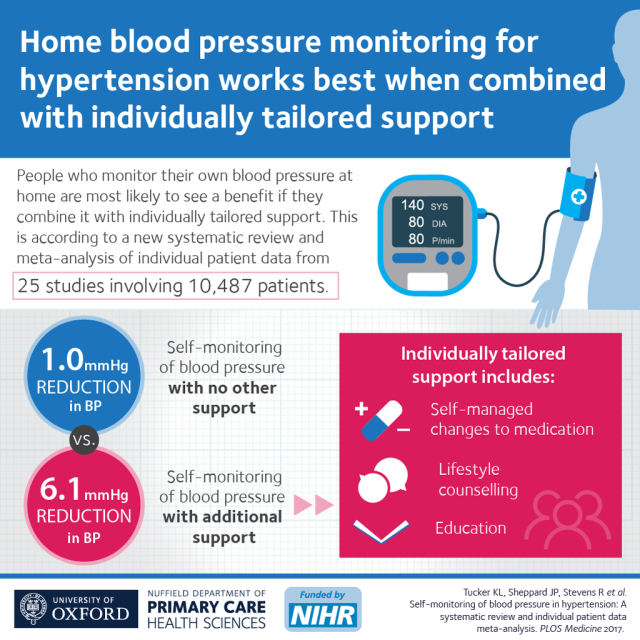 We found that if home blood pressure monitoring is combined with further individually tailored support such as; medication checks, education and lifestyle counselling, then on average much larger reductions in blood pressure are achieved. This is important because high blood pressure is the second biggest risk factor for premature death and disability in England. Research suggests that a 6mmHg reduction in systolic blood pressure (seen in the studies with individually tailored support), would reduce subsequent stroke by more than 20%. Self- monitoring of blood pressure in hypertension: A systematic review and individual patient data meta- analysis. Raised blood pressure (hypertension) affects about one in three adults in the developed world, that’s around 16m people in the UK and nearly 80m in the USA. Home monitoring (also known as self-monitoring) where an individual monitors their own blood pressure from a home setting, allows for multiple blood pressure measurements to be taken, with little or no disturbance of lifestyle, and can improve blood pressure control. People in the UK are generally quite health conscious, around 35% of people with hypertension monitor their own blood pressure, and about 10% of the general population have monitored at some stage. Knowing how to support this could improve patient’s current and long-term health. Evidence from clinical trials has shown that patients with hypertension who self-monitor their blood pressure tend to have lower blood pressure than those patients who don’t, however, the trials that have tested home monitoring show different results; ranging from no effect to a large reduction in blood pressure (9mmHg). We wanted to investigate the difference between the studies in terms of the population involved and the support offered alongside blood pressure monitoring - to determine which patient groups would benefit most and how home monitoring should best be supported. We searched the existing medical literature for all randomised trials that included home monitoring of blood pressure in people with high blood pressure. Then used the patient data from 25 large studies that provided their data (10,487 patients) to analyse the differences between the delivery and management of home monitoring, as well as differences between the patient groups taking part. We have found that if home blood pressure monitoring is combined with further individually tailored support such as medication checks, education and lifestyle counselling, then on average much larger reductions in blood pressure are achieved. Overall, self-monitoring was associated with a reduction in clinic systolic blood pressure of 3.2 mmHg (95% CI –4.9 to –1.6) when compared to usual care at 12 months. The effect, however, was strongly influenced by the intensity of professional support. This ranged from no significant effect on blood pressure with self-monitoring alone (1.0 mmHg reduction; 95% CI –3.3 to 1.2) to a significant blood pressure reduction (6.1 mmHg reduction; 95% CI –9.0 to –3.2) when self-monitoring was combined with additional individually tailored support such as with education, lifestyle counselling, or medication adjustment by a clinician, pharmacist - or the patient themselves using a plan agreed with a clinician or pharmacist. Much of the effect appears to be associated with having a personalised approached combined with medication intensification. The mechanisms for this remain unclear but are likely to include lifestyle changes, increased adherence to medication and increased prescription of medications (overcoming clinical inertia to increase medication). High blood pressure is the second biggest risk factor for premature death and disability in England. Diseases caused by hypertension are estimated to cost the NHS over £2 billion every year, and account for 12 percent of all visits to GPs. Research suggests that a 6mmHg reduction in systolic blood pressure (seen in the studies with individually tailored support), would reduce subsequent stroke by more than 20%. Hypertension is predominantly managed in the UK in general practice and GPs will routinely interact with patients who monitor their blood pressure at home. Many patients do not discuss their readings with their doctor, but this research shows that increased collaboration between a patient and either their GP, a nurse, or pharmacist can result in important decreases in BP (6 mmHg systolic on average for the more intensive co-interventions) and improved control. Home monitoring was most effective in people on fewer antihypertensive medications and with higher systolic blood pressure before self-monitoring (up to 170 mmHg systolic blood pressure). It was equally effective in men and women and in patients who had other conditions (diabetes, chronic kidney disease, and following myocardial infarction).